It may sound like a crazy proposition to venture into what is a buffer zone to a lingering war. Yet while roaming around South Korea, we were intrigued by the possibility to visit the Korean Demilitarized Zone (DMZ) between North Korea and South Korea. DMZ tours are actually somewhat of a popular pursuit for curious travelers in South Korea. Yet instead of taking one of the many DMZ-bound tours directly from Seoul, we wondered if it was possible to travel from Seoul to the DMZ without a tour. Thatâ€™s when we learned about the DMZ train. Turns out, you can take a trip out to the DMZ on your own by catching a train from Seoul. 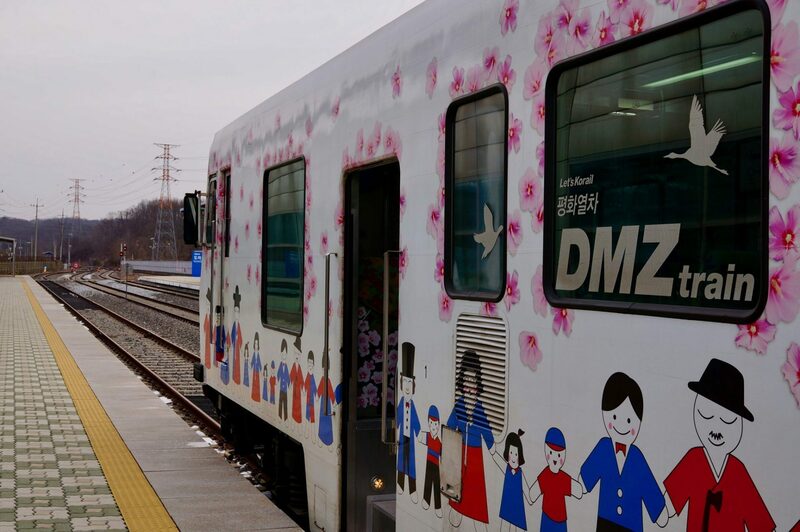 There is an official DMZ Peace Train that runs directly from Seoul to DMZ, Wednesdays through Sundays. This special train to the DMZ began operating in 2014 and continues making trips out to the North Korea border today. 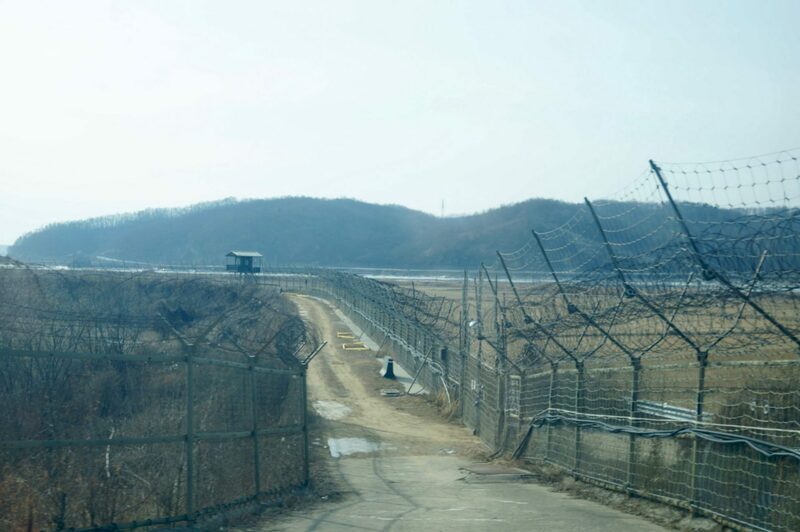 Once arriving by train into the DMZ, you must then transfer onto a planned bus course to fully experience and explore the many sites within this heavily restricted area. So thatâ€™s exactly what we did! This post now recounts this DIY day trip on the DMZ train and reviews the details of exactly how to get from Seoul to the DMZ with public transportation. 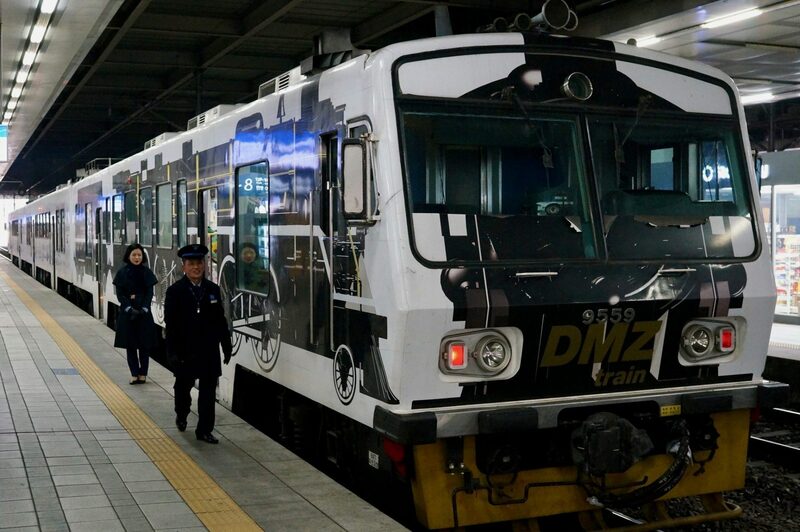 We’re always looking for the best values in travel and we found this DMZ train to be the cheapest way possible to reach the notorious demilitarized zone from Seoul. So what’s it like to ride into the DMZ by rail? This DMZ train turned out to not only be a very interesting trip, but also the most bizarre rail journey we’ve ever taken! Even as we stepped foot onto the train, we realized this would be a strange journey ahead. Adorning the DMZ train walls are an odd mix of symbols, showing peace along with harsh signs of war. For example, an empty military helmet is surrounded by words like “harmony.” Itâ€™s all quite a contrast that sets the tone for the journey ahead. The entire day in the DMZ was filled with this odd mix of war and peace. There were laughable oddities intermixed where horrible tragedies have played out. 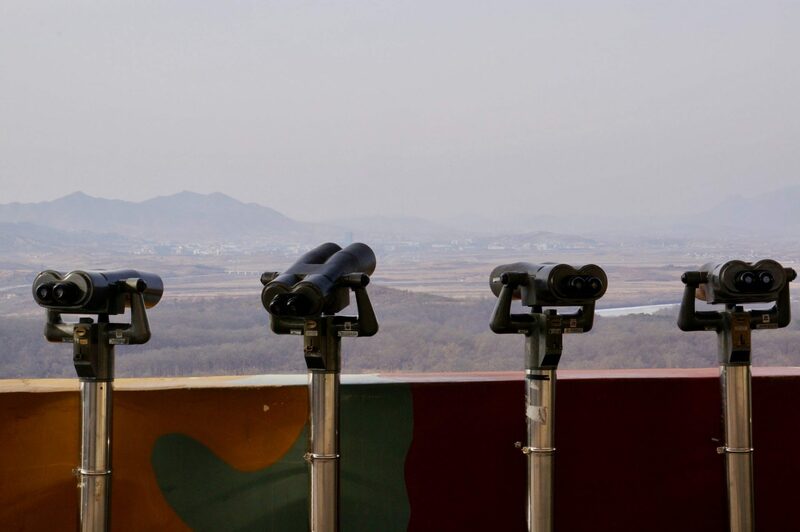 The DMZ is part war zone, but also part tourist attraction. These perplexing contradictions were themes that ran on throughout the entire day. The DMZ is a weird place in the world and taking the DMZ Train from Seoul to the North Korea border perhaps made it all the more odd of an experience. To prepare for this rail adventure to the DMZ, we made sure to dress accordingly for the day straddling the North Korea border. Thereâ€™s a strict dress code at the DMZ. Attire such as ripped jeans or skimpy outfits is not permitted here. The reason for this goes beyond a simple show of respect. It’s been reported that North Korea films DMZ tourists on the other side of the border. The purpose of this is to use such footage of people in poor apparel as propaganda to show how inferior the world is outside of North Korea. 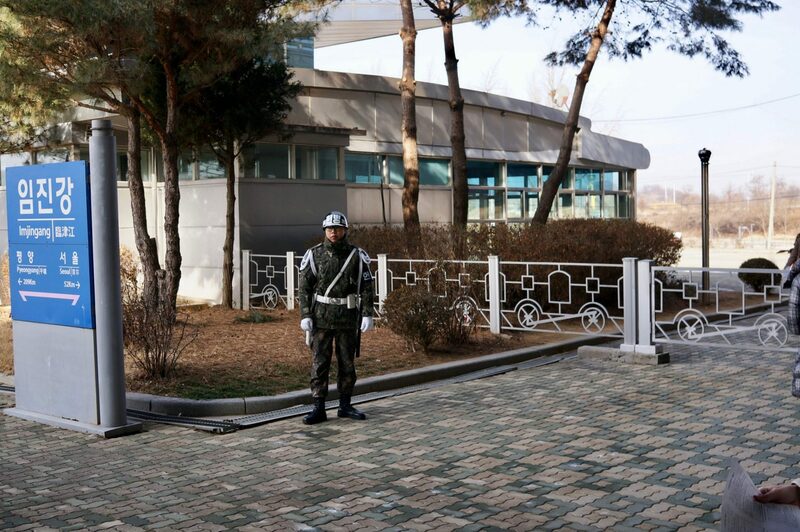 So that’s why it’s important to dress up a bit while at the DMZ. We made sure to dress the part. Our journey on the DMZ train was during a cold early-January day in Seoul, so it was an effortless task to ensure we were covered up. With winter jackets on and our passports in hand, we set off to Yongsan Station for this DMZ train day trip! When we arrived at the station to take the DMZ train, we were literally the only people who boarded. The empty train car made us a little nervous and uneasy, as we chugged toward the North Korea border. What the heck were we getting ourselves into? Where was everyone? Perhaps the empty train car was due to people not knowing about the DMZ train, as most DMZ-bound visitors opt for tours directly from Seoul. We also suspect the lack of passengers may have partly been due to heightened tensions during the time of our visit. It was around this time of escalations in early 2018 when a North Korea soldier had recently defected, while Trump and Kim Jong-Un were trading insults about who has a bigger button. It sure was an interesting time to take the DMZ train! But as we write this post now, tensions have eased significantly to a point that peace negotiations are even resuming between the two Koreas. It’s all encouraging positive signals of peace between North and South Korea. Who knows, maybe one day in the not-so-distant future the train line will continue all the way through the DMZ, from Seoul to Pyongyang by rail. That is what the Gyeongui Line was intended for after all. As our northbound rail journey continued, we were relieved to see a few more passengers board the DMZ train at the next stop. When arriving at Seoul Station, it was an almost entirely local Korean crowd joining us on the DMZ train. This trip to the DMZ by rail was an intriguing travel curiosity for us to explore. Yet for the other Korean passengers venturing North, the journey to their countryâ€™s border holds much more weight. After leaving Seoul Station, it was a nearly direct route on the DMZ train without stops. The highrises of Seoul soon faded, as the Gyeongui Line tracks wound through the Korean countryside. Taking the DMZ train was a pleasant yet uneventful rail journey that lasted a bit more than an hour. But once we neared North Korea, that all changed. We arrived at Imjingang Station. This is the final train station before entering the DMZ. 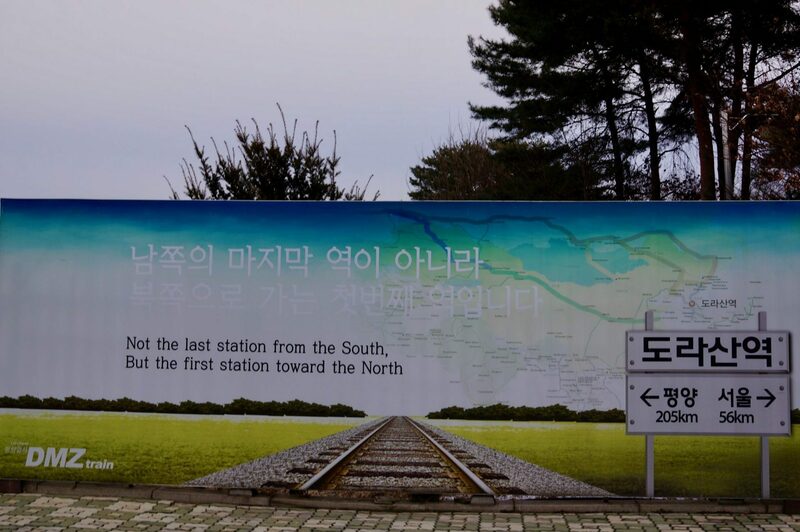 The Imjingang Station was formerly the final stop on the Gyeongui Line before the DMZ train began allowing visitors to go beyond it, once it began operating in 2014. Before arriving at Imjingang Station, we were required to complete an application to gain entry. But given our inability to read Korean, we had no idea what we were agreeing to. We signed anyways and stepped off the train with our passports in hand. We waited in a short queue at this military checkpoint and were processed in as if we were entering another country. But this DMZ train to North Korea stops just short of the border with North Korea. So there are no immigration procedures or passport stamps issued. It was all quick & easy, as Korean military officials cleared us. 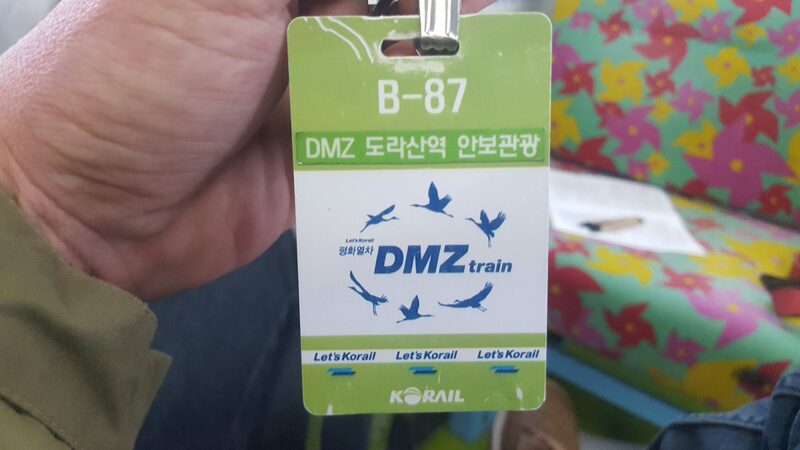 Within minutes we were back on the DMZ train, with our visitor credentials, and ready for the final stretch. This is when the train actually enters the civilian-restricted area known as the demilitarized zone (DMZ), which separates North and South Korea. The train crosses the Imjin River and the big windows allow passengers to watch this transition unfold, as the train slowly travels on a bridge over the river. 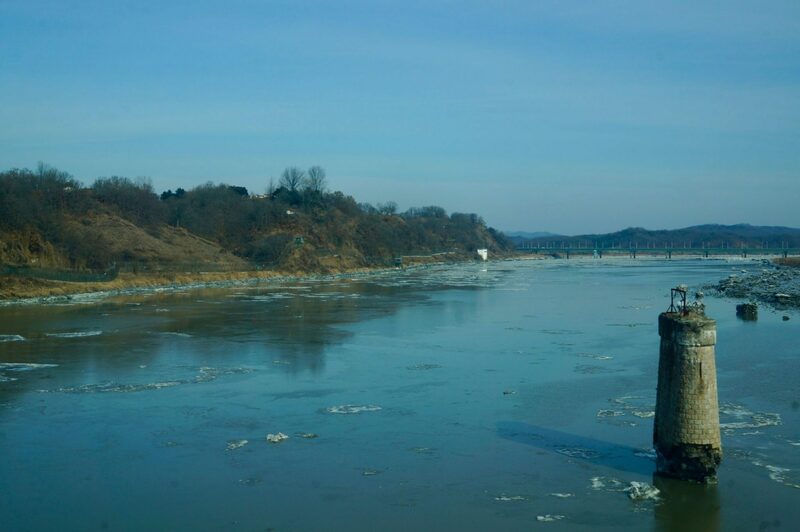 It’s eerie to see remnants of the former bridge that had been destroyed during the Korean War. The prevalence of barbed wire fencing and minefields is a clear indication that we just entered a war zone. 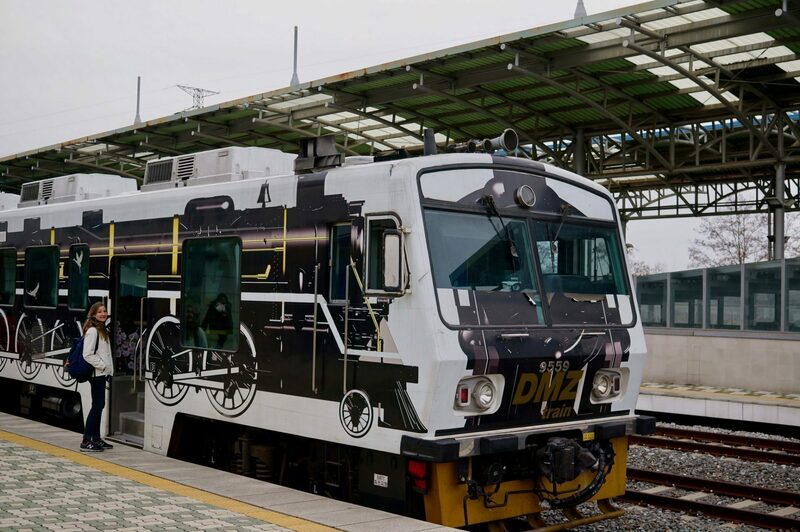 The final destination aboard the DMZ train is Dorasan Station. So we disembarked the DMZ train to explore Dorasan Station, which is an oddity on its own merits. Many of the DMZ bus tours even stop at Dorasan Station because it is a point of interest on their tours. Yet for us, it was our departure point arriving on the one and only train that currently pulls into Dorasan Station nearly every day. This little-used train station sits a bit more than a mile from the actual border of North Korea. We were close! Given this is the only arrival each day, Dorasan Station sure is a large and grand station. Dorasan Station was constructed in the early 2000s and the rail lines actually do connect North Korea and South Korea. But, of course, the border remains closed today. There have been some freight trains between the two Koreas that have been permitted to pass on occasion. But there are absolutely no passenger trains in South Korea that can continue on to North Korea. Dorasan Station is the final stop. 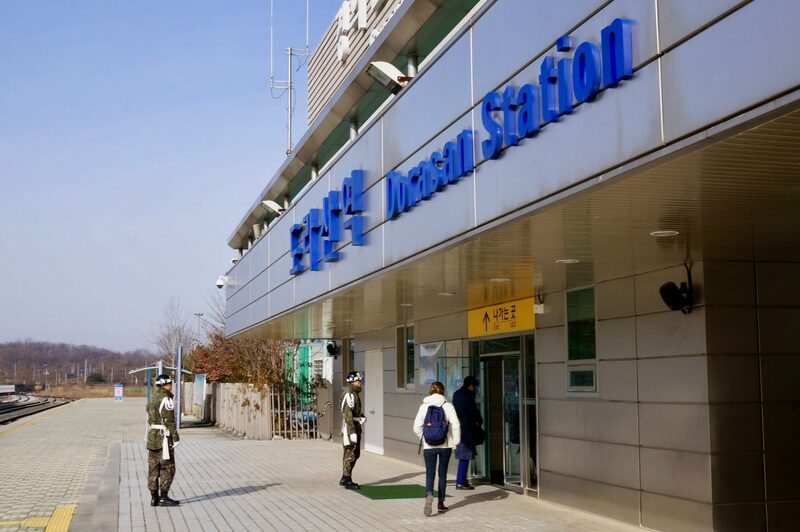 As a result, this big and immaculate station remains largely symbolic rather than a functional transit point between North Korea and South Korea. Yet there are visions of Dorasan Station to one day link North and South Korea by rail. With Seoul located 56 kilometers to the South and Pyongyang 205 kilometers to the North, perhaps one day a train between the two Koreasâ€™ capitals may be a reality. Upon peace between the two feuding nations, unification by rail and otherwise is the dream. Having North Korea and South Korea connected again by trains may not be so far off. 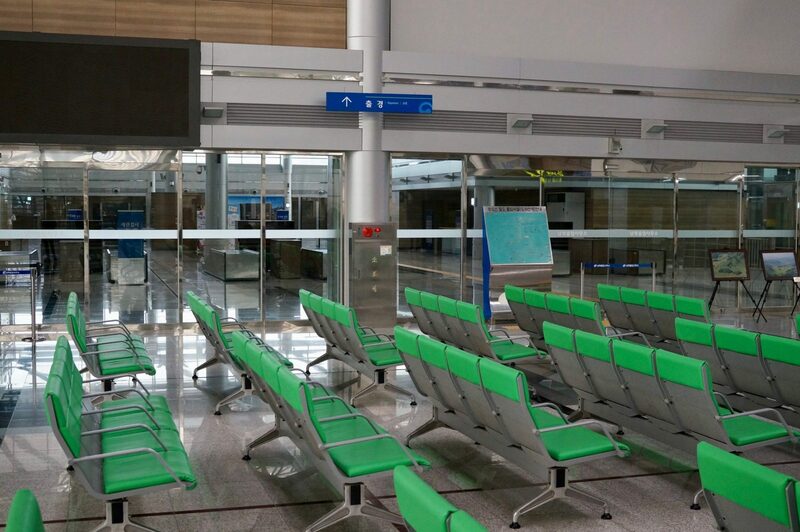 Dorasan Station actually appears completely ready for the next departure to Pyongyang. The station is part propaganda, which makes a bold statement. Yet it shows South Korea’s clear vision and readiness for unification. Thereâ€™s an empty arrivals hall, a full customs & immigration area, and even an Inter-Korean transit office. South Korea appears all set to resume passenger service to North Korea. It looks as if it could begin operation for train service to North Korea tomorrow if needed. Dorasan Station proudly flaunts that this infrastructure is in place. From Dorasan Station, passengers are not permitted to tour the various sites throughout the DMZ on their own. So we transferred onto a bus that is timed perfectly to connect with the DMZ train. This bus for DMZ train passengers goes on to visit many curious sites scattered throughout this buffer to war. The alternative is to hang around Dorasan for five hours, when the DMZ train returns back to Seoul. Our first stop was the Dorasan Peace Park. This park, completed in 2008, was developed to help youths better understand the history of the DMZ. Funded by donations from people living in the local area, the park is chock full of a strange assortment of curiosities! There are sculptures, history plaques, a small ecology museum showing the DMZâ€™s wildlife, decommissioned army tanks, an enclosure with deer, a tall looming cone tower, a frisbee golf course, a look-out point, and even something called the Paul McCartney Forest to commemorate the former Beatles singerâ€™s first concert in South Korea. Who knew you could play a round of frisbee golf amongst killing machines in the middle of a “peace park” inside this war zone? We were given about a half hour to wander all around the Dorasan Peace Park, unescorted and on our own, to explore these many novelties. 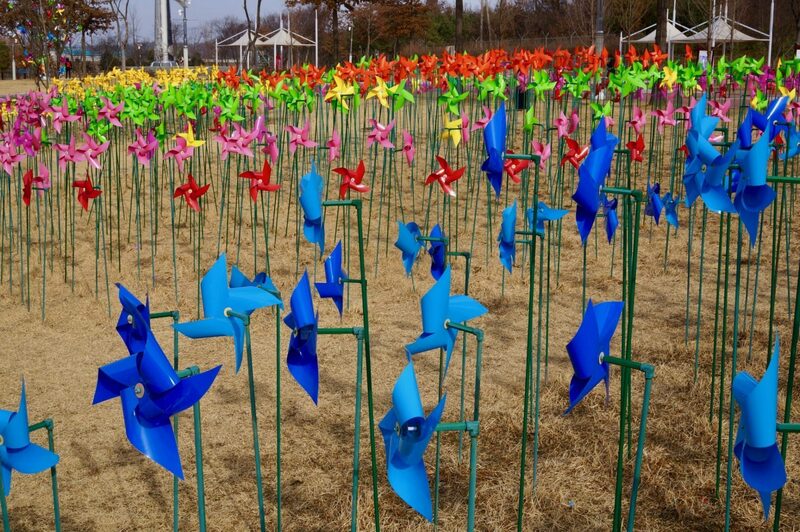 It was uplifting to step through the colorful pinwheels, a bright symbol of peace within the DMZ. 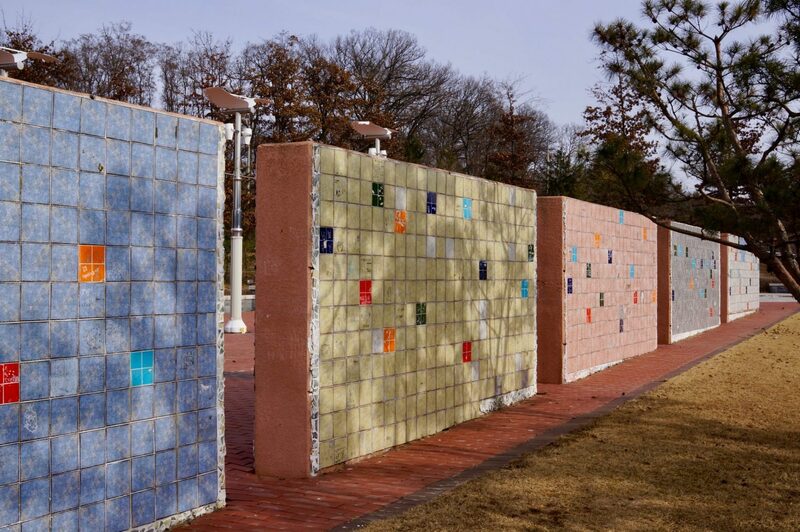 Yet perhaps most notable are the portions of the Berlin Wall that have been reassembled in the park as a sign of encouragement by Germanyâ€™s reunification. The next stop was for lunch at a military cafeteria. 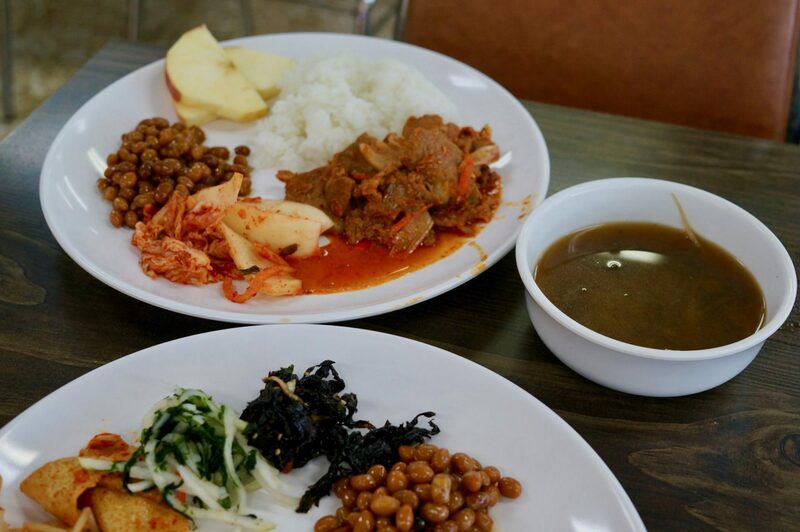 It’s a bare-bones dining hall with a buffet of Korean staples. 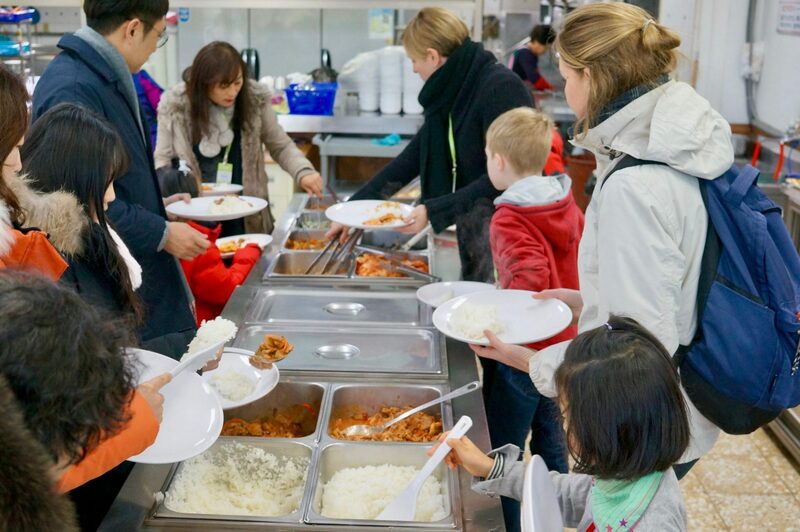 Of course, there would be rice and kimchi on the buffet line in addition to some stewed meat, veggies, beans, and soup. It wasn’t great, but not bad either. Yet it provided a unique and interesting experience to dine in a military mess hall within the DMZ. The Dora Observatory is located about a mile from the border of North Korea. 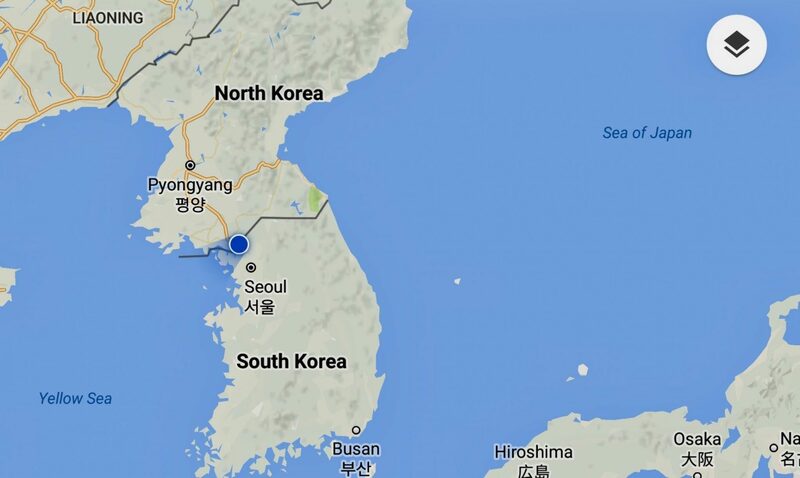 Our GPS confirmed just how close we were getting to North Korean. The Dora Observatory is so close to North Korea that it allows visitors to gaze down into North Korea. The Observatory is perched up atop a mountain and you can clearly see into North Korea down below. Binoculars are provided to further assist visitors to spy on the northern neighbor. So whatâ€™s to see on the other side of the Korean border? 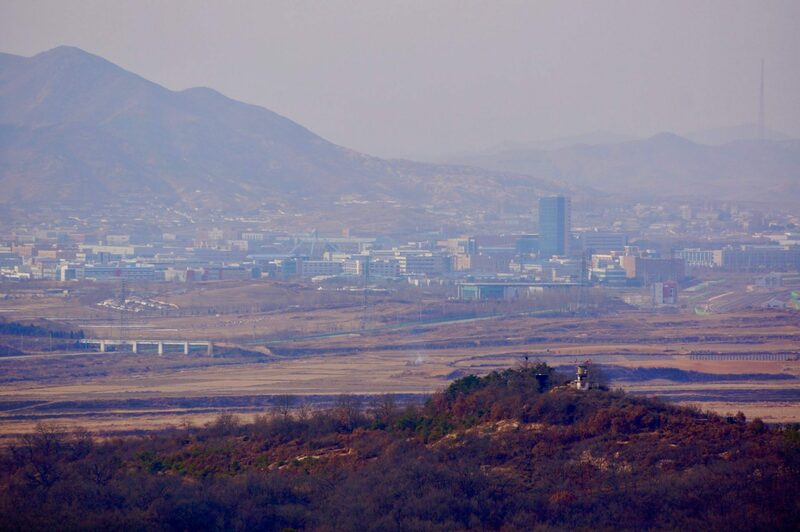 We gazed right down into the industrial North Korean town of Kaesong. The factories appeared active with the industrial plants producing exhaust from the rooftops and perhaps adding to the heavy haze in the air. Yet there wasnâ€™t much life visible in the empty streets. 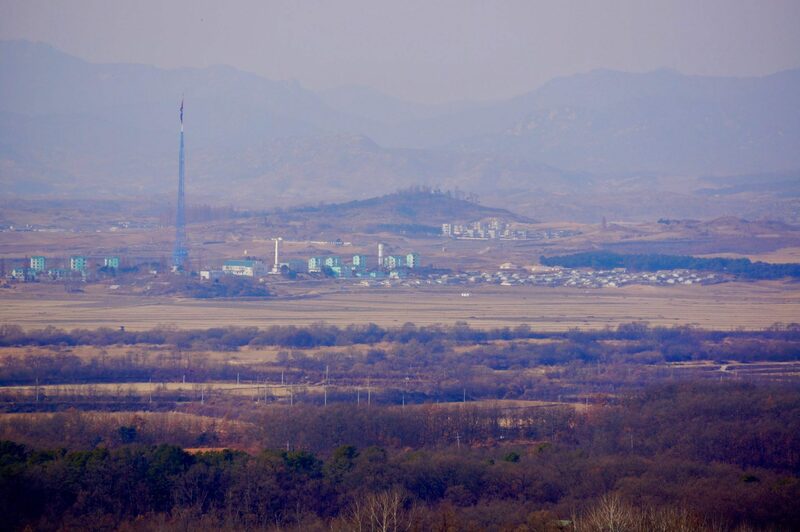 Also of interest in North Korea is the gigantic flag poll that almost resembles a skinny Eiffel Tower. This is the result of what is known as the â€œFlagpole War.â€� In the 1980â€™s South Korea had erected a 98-meter tall pole waiving the South Korean flag. So North Korea retaliated by building what became the tallest flagpole in the world at the time, soaring 160 meters (525 feet) high. 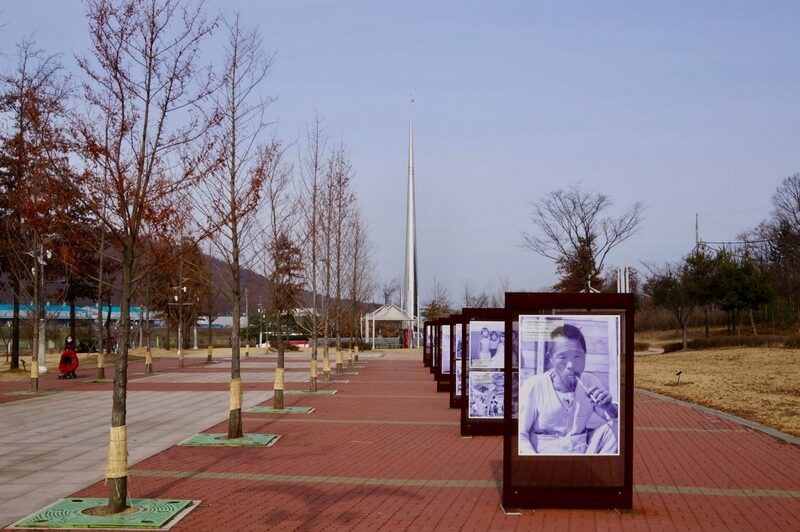 This towering flagpole is still flying high today in Kaesong, although it now the fourth tallest flagpole as taller flagpoles have since been erected. While gazing across the border, we could clearly hear South Korean audio recordings blasting over loudspeakers. These recordings are aimed at anyone within earshot on the other side. The audio propaganda is said to have since ceased at the time of writing amidst current peace talks. The final point of interest on the bus circuit from the DMZ train is whatâ€™s known as the 3rd Tunnel of Aggression. This secret passageway was built by North Korea as a potential entryway into South Korea. Although North Korea will tell you that they were simply digging a coal mine, in this contested area that holds no known coal. 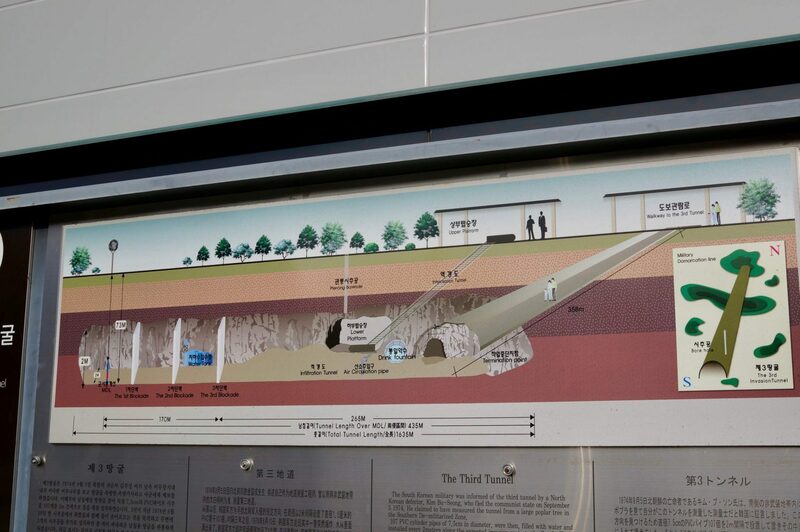 This was the third such tunnel along the DMZ to be discovered by South Korea, hence the name. Yet a few decades after the tunnelâ€™s discovery, South Korea has transformed this sign of aggression from the North into yet another bizarre touristic site to now explore within the DMZ. We were armed with hard hats and then allowed to venture on our own, over a quarter-kilometer down into the deep and dark tunnel in the DMZ on our own. There are strictly no cameras allowed, hence we could not take any photos from within the third tunnel. Although we were unescorted inside the tunnel, inching closer to North Korea, there was closed circuit surveillance monitoring us each step of the way. Itâ€™s a claustrophobic space of only about 2 meters (~6 feet) wide and high. We soon learned why hard hats were required to enter as we bumped our heads many times along lower-lying sections of the tunnel until we reached an armed blockade which we could proceed no further. This would be the closest point to North Korea during our day in the DMZ. It was here deep in the 3rd tunnel that we were a mere few hundred meters from the border of North Korea. Back up into the daylight, we found that the grounds surrounding the once-secret tunnel between warring countries is now strewn with strange photo ops. Itâ€™s here where you can show your friends how you crossed the border from South Korea into North Korea! Except, in reality, this all still is entirely within South Korea. We were extremely close to North Korea, but this is not the actual borderline. 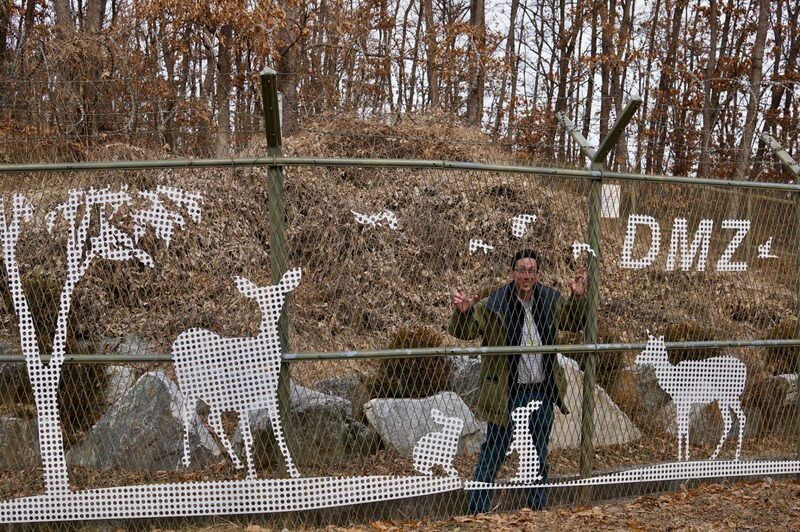 Nor were we actually behind the DMZ fence in North Korea. It’s just for fun. And it felt a little strange to be goofing around with these funny props in this otherwise extremely serious place in the world. The onsite DMZ Pavillion museum gives a stark contrast by reminding visitors of the somber realities of the divided nations. The bus ultimately brought us back to Dorasan Station for the return DMZ train journey back to Seoul on the same Gyeongui Line we had rolled in on. The hour and a half train ride gave us time to try and reflect on this strange day that we just spent within one of the most heavily guarded borders in the world. ðŸ†” Don’t forget to bring your passport. Very important! ðŸ•™ Plan to arrive at the train station early to ensure time to deal with any Seoul traffic, buy tickets, locate the train’s departure platform, and catch the DMZ train. We suggest planning to arrive at least 30 minutes before departure time to be on the safe side. ðŸ‘– Dress nicely. No ripped jeans. No revealing clothing. â„¹ï¸� While on the bus, touring the DMZ, everything was explained in Korean. Therefore it can be worthwhile to research some of the sights you’re visiting in advance. We also suggest a visit to the expansive War Memorial of Korea, which houses a plethora of exhibits related to the Korean War and the DMZ. 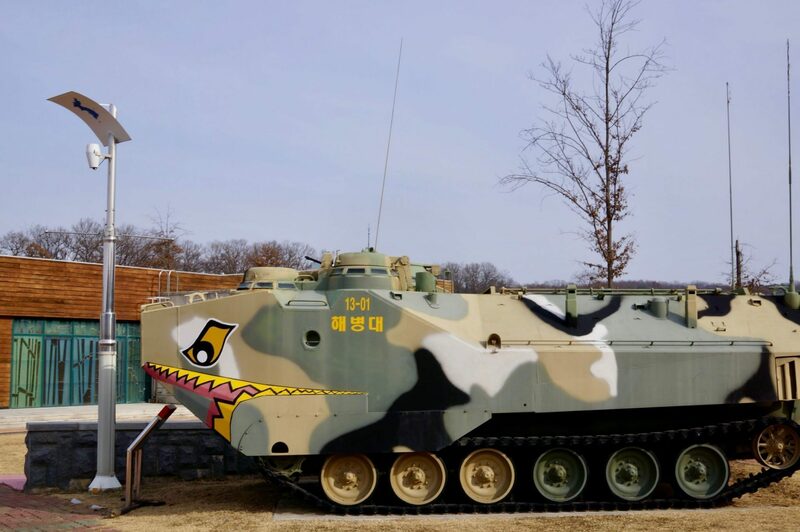 It can prove to be a good idea to go to this War Memorial museum before a trip to the DMZ, to gain a deeper understanding of this area and the ongoing conflict. The DMZ train does not operate on holidays, Mondays, or Tuesdays. The DMZ train runs on a strict time schedule, so don’t be late. The times below are when the train departs the station. Arrive early. To get from Seoul to the DMZ you must purchase two one way tickets to form the roundtrip journey. DMZ train prices differ slightly depending on which of the two stations are the departure point. 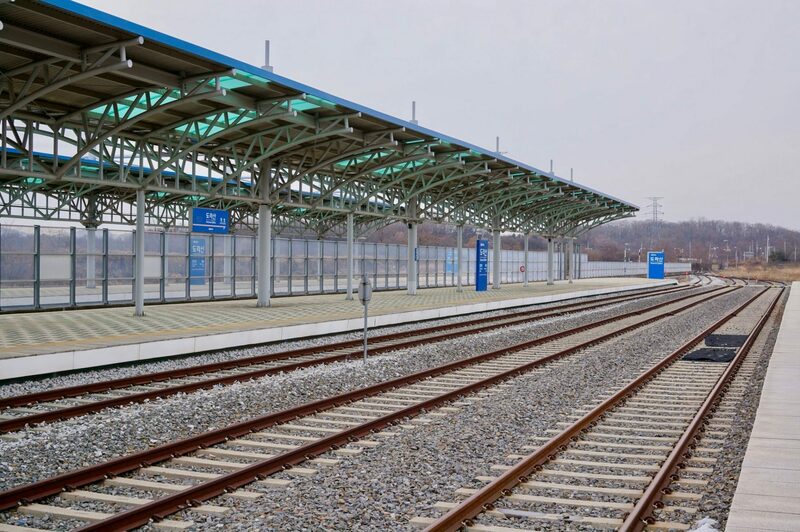 It is possible to purchase DMZ train tickets directly on the Korail website. However, it’s a bit of a clunky interface in which you must make two separate purchases of one-way tickets in order to secure the roundtrip passage that’s needed. But the site does work and you can secure your tickets in advance using the site. 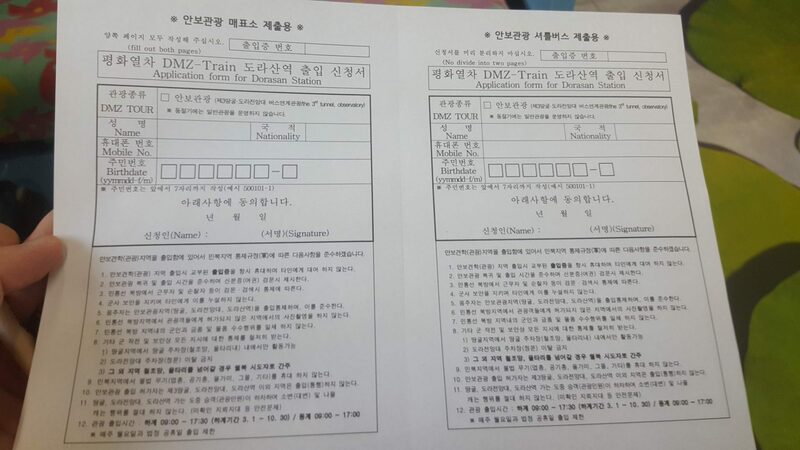 Just be absolutely certain you have purchased both your outbound and return DMZ train tickets. To avoid any complications, we suggest booking your DMZ train tickets at the ticket counter at either Seoul Station or Yongsang station. Note: there are automated machines to purchase DMZ train tickets at these stations, but we found they did not accept foreign cards. Therefore we suggest it’s best to secure your DMZ train tickets at a counter with a ticket agent. The bus tickets to tour the DMZ sites from Dorasan Station are sold separately. Those bus tour tickets can be purchased while on the DMZ train as an usher comes by to sell them. Both cash and credit card are accepted for this separate ticket purchase on the DMZ train. We enjoyed our experience of taking the DMZ train. It was unique to arrive into the DMZ by train and overall our DMZ train review is definitely a positive one! The trip was somehow both fun yet sobering, and extremely interesting every step of the way. The DMZ train is also among the cheapest ways to reach the DMZ. Despite this positive DMZ train review, we’d be doing a disservice by not pointing out a few advantages in joining a proper tour from Seoul instead of taking the DMZ train. The DMZ train does have a few shortcomings when compared to a tour from Seoul. Below are some considerations to keep in mind to help decide between the DMZ train and a DMZ tour from Seoul. Whichever way you arrive to the DMZ is largely based on personal preference on how you want to roll to the DMZ. English May Not Be Spoken: During the bus portion of touring around the DMZ, all narration, guide service, and even simple announcements were entirely in Korean. During our tour, there was no English spoken at all. As a result, we had no clue about the significance of the many sites we were touring around. Some friendly bilingual Korean passengers politely whispered to clue us in on critical information, such as how much time we were allocated at a stop. But we largely missed out on learning about this unique place in the world while we were there. Update March 2019: A reader has reported that their bus tour did provide English commentary. Meanwhile, most all DMZ bus tours from Seoul are guaranteed bilingual and geared towards English speakers. 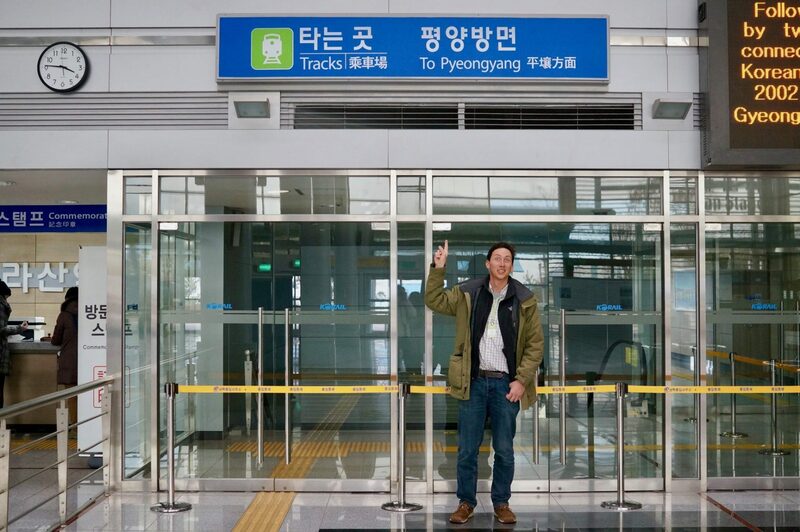 No JSA: Visits to the JSA (Panmunjom) are not possible when taking the DMZ train. The Joint Security Area (JSA) is the actual border between North and South Korea where soldiers between both countries face each other. It’s also where you can be permitted to actually slightly cross the border and briefly step foot into North Korea while within the buildings of a special neutral zone. This famous truce village can only be visited as part of a tour from Seoul, like this one. People who visit the JSA tend to rave it is an immense highlight of their DMZ experience. Read reviews and book JSA tour here. Timing: There are DMZ tours that depart 8:00 am and return to Seoul around 2:30 pm, allowing the remainder of the afternoon to explore the capital. Meanwhile, the DMZ train tour returns to Seoul just before 6:00 pm. Hotel Pick-Up: Most all DMZ tours from Seoul offer free hotel pick-up, making for a more seamless experience and saving on transit expense on getting to the train station. What’s the Cheapest Way To DMZ? 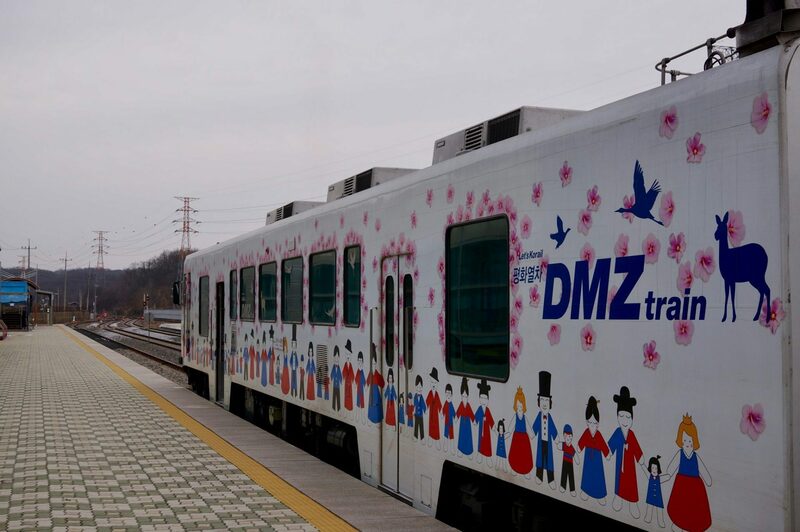 The DMZ train is the cheapest way to tour the DMZ from Seoul. Yet once all the costs of the DMZ Train are tallied, the DMZ Train roughly costs the same as the DMZ tours from Seoul. English-speaking DMZ tours from Seoul run low as only â‚©44,000, like this inexpensive tour from Seoul that receives excellent reviews, includes hotel pick-up and a nearly identical DMZ itinerary to the one we went on from Dorasan Station. 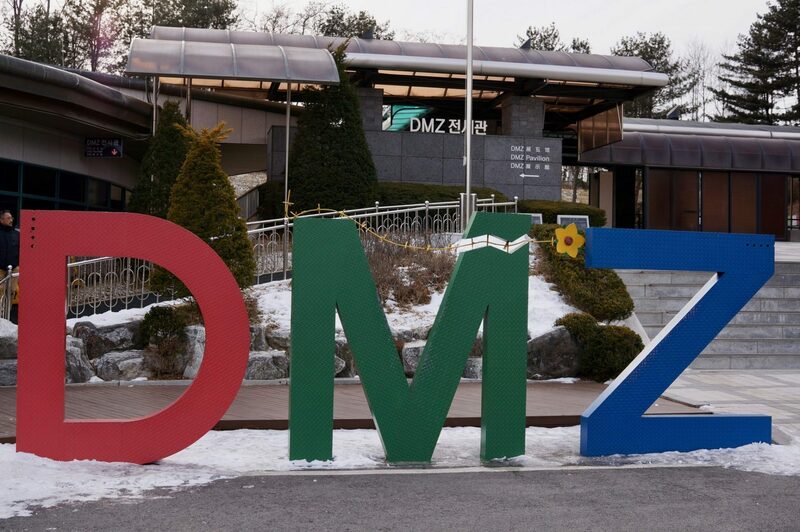 Book this DMZ bus tour from Seoul here. For the DMZ train, once you factor in the costs of getting to the train station (taxi, subway), the bus tour, and lunch, the price of the DMZ train becomes roughly the same as a tour from Seoul. So we advise choosing between the DMZ train and a tour from Seoul based upon the other factors mentioned above, rather than price. The DMZ train from Seoul to the North Korea border was certainly the most bizarre rail journey of our travels. It was such a unique experience that made for a memorable day. This rail journey left us sharing South Korea’s vision of unification. We can only dream of one day potentially taking an epic rail trip from South Korea through North Korea and beyond to China and even connecting to Europe! Maybe one day. Yet for now, it remains an interesting novelty to take the DMZ train to its final stop of Dorasan Station. Next stop, Pyongyang! The New Tequila Herradura Express: So Much Fun! I enjoyed reading this article so much! Gave me an idea of what else I should do in my SK trip this year. I understand that DMZ bus tours from Seoul already include going to the DMZ and back to Seoul transportations, however, Iâ€™d like to experience the DMZ train too. Do you have any idea if itâ€™s possible to go to the DMZ on a tour bus and experience the JSA and come back to Seoul using the DMZ train? You can inquire with the tour companies to be certain, but I really don’t believe that would be possible. Those JSA tours are very highly regulated, given the restricted area that is visited. It’s doubtful they’d drop you off unaccompanied to take the train back. Most JSA tours do include a visit to Dorasan Station, so that would still give you some idea of train travel in the DMZ. 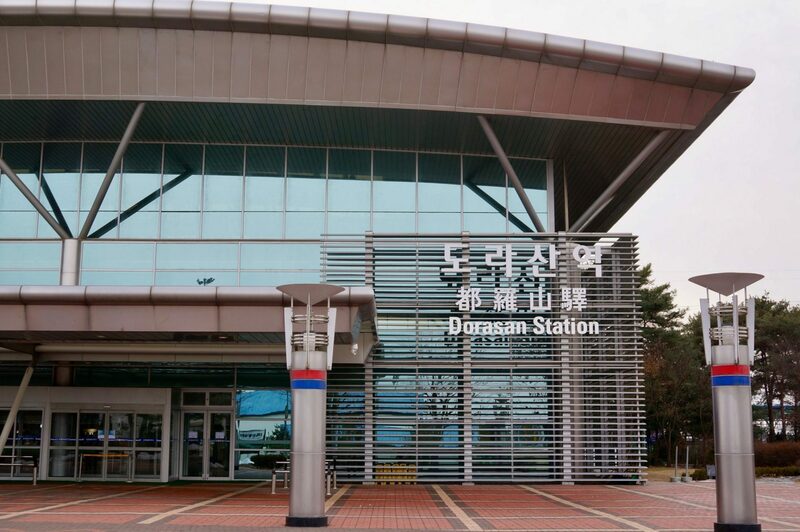 The Dorasan Station itself is pretty interesting. You simply wouldn’t have the experience of actually riding on the train. Doing both experiences on two different days wouldn’t be practical either, as most all the same places would be visited on both tours, with the exception of the JSA itself. It would be a great idea to be able to do the train and the JSA together, but it’s currently not a tour/route that is offered. I’d suggest trying to decide what’s more important to you, the train ride or a visiting the actual border at the JSA. Either one is a good option, really. Thanks for this! I did the same trip yesterday (March 2019) with the help of this page. Happy to share that things have got even easier since – the bus tour is now in dual Korean/English, and the time in each location is shown clearly on an LED screen held by the guide as you exit each stop. Also at Dora Observatory all binoculars are now completely free to use, and I think I only paid 7,000 for the buffet which would be a decrease in price. The attractions remain the same but the peace park and Dorasan station now have many photos of the historic meetings between the North and South leaders last year, giving the day a lot of recent optimism for the future. On a Thursday in March there were about 15-20 of us on the train, only three of which non-Korean (me & two others) – so it’s still something that remains a little-known secret way of seeing the DMZ! Thanks so much for this update! It’s really helpful to help keep this post up-to-date and help other travelers partake in this interesting experience. Gamsahamnida! In fact, I’m going to update some of this in the body of the post right now. It’s so great to hear they now do the bus tour in English. And free binoculars too – fantastic! 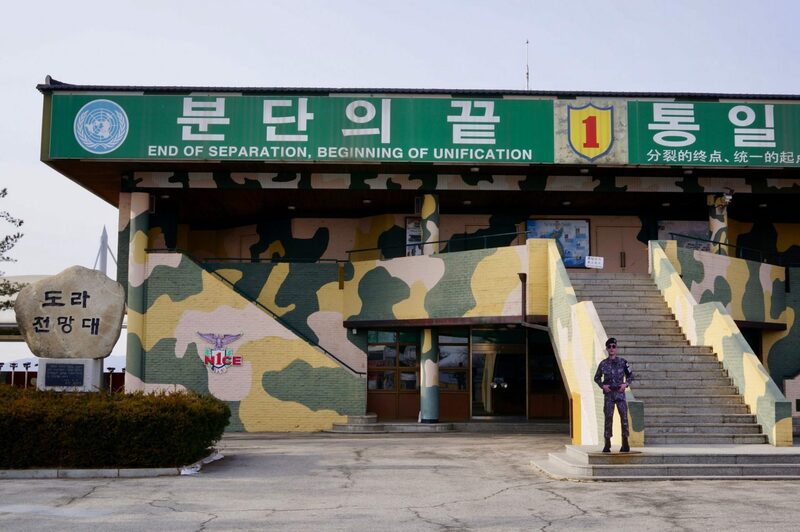 I’ve been wondering how the DMZ area may have changed since the inter-Korean summit occurred, so it’s quite interesting to hear about the added features documenting this bit of recent history and further spreading that hopeful and optimistic outlook. Am still surprised that so few people embark on the DMZ train. It was about the same when we went too. Perhaps this post may help others to embark on this unique adventure without totally letting the secret out. ðŸ™‚ Thanks again for the update! Any tips to eating in Seoul, like best places/worst places? Traveling in the summer with my wife and kids. Korean BBQ is a must, of course. Bibimbap is one of our favorite Korean foods. Bindae-tteok (mung bean pancakes) washed down with makgeolli was another favorite of ours in Seoul. Lots of great food in the city and we only scratched the surface! Endore Billy’s remarks, the buffet is 7000 won and the tour 16000 if you are an ‘elder’ or 18 000 if you are younger and 17200 for children. Train pretty full yesterday, our carriage containing Indonesians, Thais, Swedes, Germans and English as well as a good few Koreans, in a way, our own little United Nations on our way to see the disunity of Korea. Now a little snack bar on the train so an 11 o’clock beer before Imjingang Station was very welcome. Overall feeling of great sadness, I think there is no hope of reunification and the short movie of the madmens continued and relatively recent aggression before the tunnel visit showed, despite all the hope that the peace park and the aspirations on the giant tapestry in the Dora observatory floor showed – a tapestry that one is free to sign and as far as I could see had been endorsed by folks from virtually every country in the world. How a madman can single handedly deny the aspirations of the entire world as well as the Korean people is beyond me. John – many thanks for your brilliant blog, it must have taken a lot of time and effort and was an inspiration for the wife and I to go take a look. Good luck man. Thanks so much for the update and kind remarks! So glad to hear this proved helpful in pursuing the DMZ Train. Also love hearing you had your own little UN plying the rails into the DMZ. That is in of itself is a nice little message of peace and unity. ðŸ™‚ Oh, and beer too, hehe! Hi. Where and when did you pay for the bus tour. Was it before you got on the train or when you got to dorasan station. Thanks very much for putting all this information together! Great breakdown of costs, timings and pros/cons of the train vs. tour options. Really, really thorough! I’m returning to SK next month; I lived there ~25 years ago — LOOONG before the DMZ Peace Train was a thing. Safe, happy travels to you from Sam in YYJ. Glad it helped and we hope you have an excellent return to South Korea! Great review! I’m brazilian and very interested in DMZ visiting. You have explained a lot about this half-day trip. Next time in Korea I’ll do it. 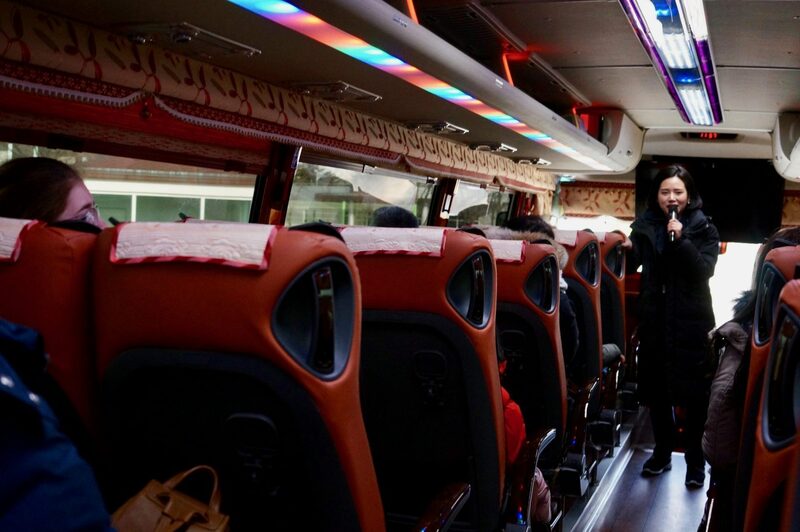 Hi, may I know about the bus tour for DMZ train passengers? How much is it? When you mentioned that the bus tour is time perfectly with the DMZ train, does that mean once we arrived at Dorason station we can immediately hop on the bus? And the bus knows when to drop us off to catch train back to Seoul? Thanks. P,anning to visit next Tuesday . Hi Sharon, Be sure to review the costs section of this post which has all the details. The bus tour is â‚©13,000 per person. The buffet lunch adds another â‚©8,000. Yes, the train is timed to connect with the bus. Once you arrive at Dorasan Station, you’ll be ushered onto the bus. This bus is specifically for train passengers, so it does drop passengers off back at Dorasan Station to catch the train back to Seoul. During our trip, the bus dropped us off back at Dorasan before 4:00, so we had more than a half hour to explore Dorasan Station a bit before taking the DMZ Train back to Seoul. Hope that helps and you have good trip! Dear John, thank you for the valuable information. Hi John, do you have any information of which tour you took that was â‚©13,000 per person?? Thanks! Yes, it is a tour offered whilst on the train. 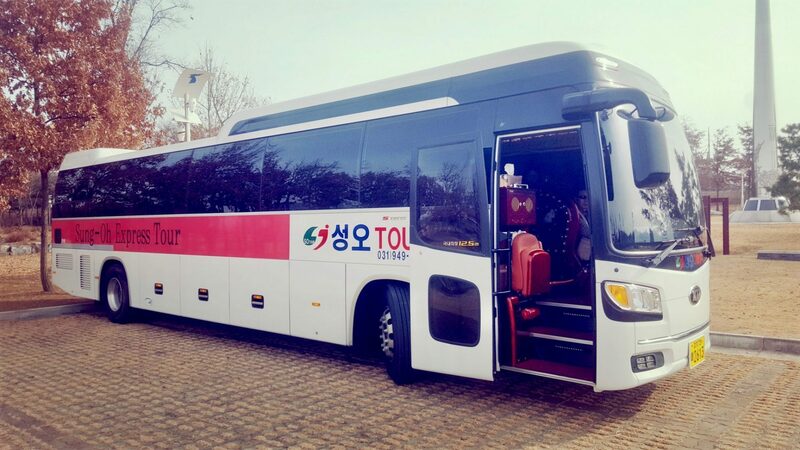 It’s a bus tour from Dorasan Station, visiting Peace Park, Observatory & Third Tunnel, as documented all throughout this post. Just let me know what else you’d like to know about it. Great guide, thank you for taking the time to write such a comprehensive guide to an unique place. Hope to be able to visit, or maybe to see the place when the normality returns… always hopeful! I have a lot of friends that served in Korea and I always kick myself for not going to visit them while they were there lol! I definitely would like to visit and see the DMZ for myself. I’m glad you guys were able to find a cheaper way to get there. It’s never too late to plan a trip to Korea! ðŸ™‚ There was still a decent US military presence stationed in and around Seoul when we were there. Met many at the bars, lol. If you ever do make it out that way, would definitely recommend taking a poke around the DMZ. We thought it was really interesting! What a bizarre trip! I really enjoyed living vicariously through this one as I doubt I’ll ever make it to Korea let along the DMZ. Even the train looks bizarre! I love your goofy shots with the props and the tunnel sounds fascinating. The nearest I get is that I visited the USSR in the days back and enjoyed a tour of Yalta with a Soviet guide. We were in our early teens and being a little provocative. The minute we asked a political question, our guide just started her speech from the start again! Loved this post. I love trains, especially long train rides on the window seat. I did not know such a journey was possible, that too to the border of N Korea! And the train itself looks pretty sleek and futuristic. Someday I’ll do it too. Holy guacamole! I had no idea that is was even on the radar for tourists to visit the DMZ! 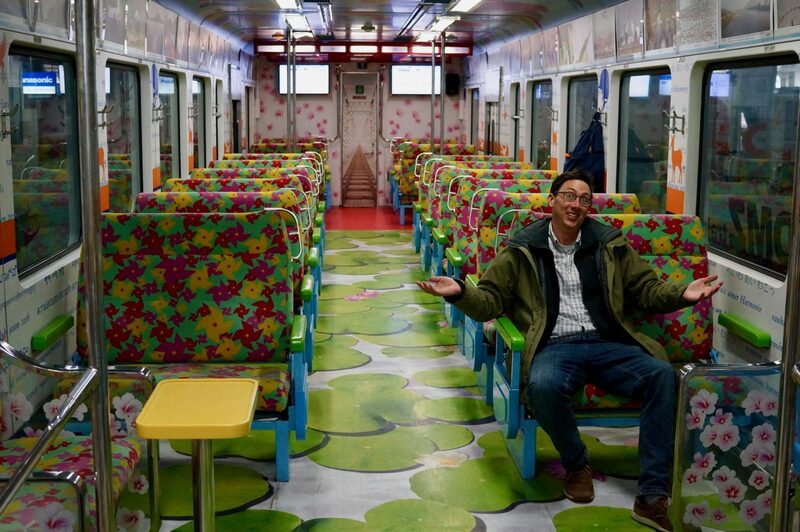 I love the interior decorations of the DMZ train. And the fact that South Korea has a fully stocked station ready to go as soon as peace breaks out. I’ve seen North Korea from the Chinese side many years ago, it did not look anything like that! The barbed wire and fences are scary but it looks like you guys had a great time. I was wondering where all of those pieces from the Berlin Wall went! What an interesting part of the world to visit! Thanks for sharing! Right, we had no idea either! Kinda crazy to chug up in a train to what is possibly one of the most heavily fortified borders in the world. That Dorasan Station seems fully ready for northbound service. I think it’s partly just trying to make a statement, but it truly does have all the facilities and it’s a nice station! It’s quite interesting and symbolic to have found that those large pieces of the Berlin Wall made their way to the DMZ. Gave me chills to see that there. I’m still floored that the most heavily guarded border in the world can be visited as a tourist. It must have been surreal with the remnants of war mixed in with cutesy kitsch and even the frisbee golf park! When you guys were looking down from the observatory did you see anyone looking back? This is really interesting! I didn’t know you could do the DMZ tour on your own. I always thought you had to go with an organised tour company. it looks like not many other people realise this either, judging by the empty seats! Yeah, we were also kinda surprised to find we could take a train into the DMZ. Then we were shocked when we found we were nearly the only ones on the train. But it all made for one of our most interesting days while roaming around South Korea. What an incredibly bizarre experience. Who knew there was a DMZ peace train and you could have the carriage all to yourself, what luck! But seriously, this is why travel is so important these days. You often never get a fair picture from the mass media of destinations. I think having a first-hand experience like this, documenting it and sharing it with others so they can also learn is so very important for today’s society. I never even considered the possibility that one could visit the border without a tour. How much cheaper is it? The tunnel between the two countries is very interesting – I supposed there’s a dead-end because North Korea blocked it up once South Korea found out? It’s definitely an interesting novelty! ðŸ™‚ Taking the train plus the DMZ bus circuit we did comes out to nearly the same price as the cheapest tours from Seoul, but ultimately the DMZ train proves to be a few thousand won (a couple dollars) cheaper than the absolute cheapest DMZ tours we saw from Seoul. Regarding the tunnel, from the furthest point we got to, it’s fortified with fencing, barbed wire, artillery, etc. Somewhere beyond that there is a series of three blockades that have been installed. Wow! I’m sure that anyone who served a tour along the DMZ has some interesting tales to tell. I can understand how your friend liked Korea – we also really enjoyed it. 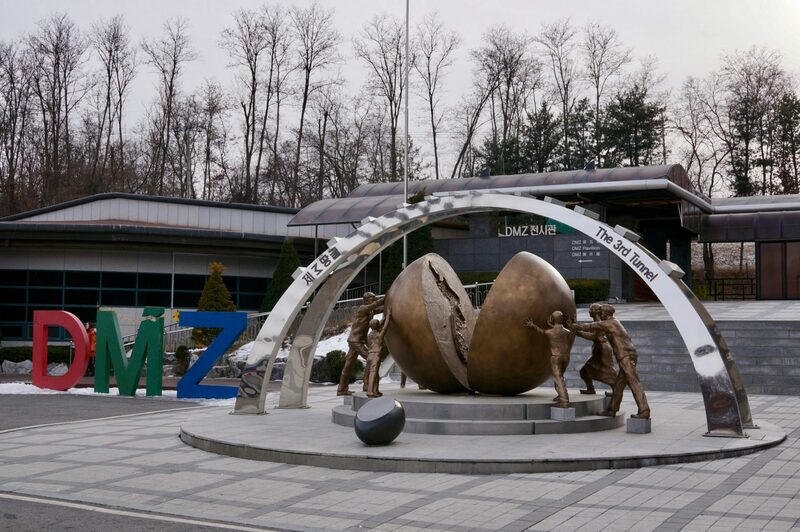 Regarding the delayed 2001 start to the DMZ Train, it’s funny you mention that, as there are signs depicting this at Dorasan Station, with pics of Pres W Bush at the station doing ribbon cutting and everything. Now that’s interesting, Didn’t know DMZs can be open for tours. Got lots of questions swimming in my head that I don’t even know where to begin. Ah! Wow, what an adventure! Your post is super informative and now I want to visit Korea, just not sure about taking the train all the way to the DMZ!